Igneous claims the service, which supports Amazon’s S3 API, merges the benefits of both cloud and local storage solutions by putting an Igneous-managed system on-premises. Customers do not purchase the equipment or manage it on an ongoing basis - that is done by the Igneous Data Service, which handles monitoring, maintenance, software updates and troubleshooting. Instead, Igneous charges an annual subscription based on installed capacity - it can be purchased in increments of 212 terabytes (TB) of usable capacity, starting at under $40,000 USD (equivalent to 1.5 cents/GB per month). 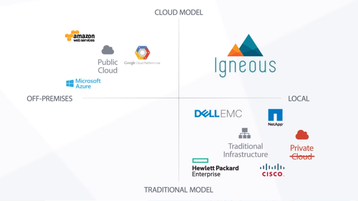 “Igneous offers a differentiated approach to solving the complex challenges of data-centric computing in the enterprise where management of large-scale infrastructure has grown untenable,” Scott Sinclair, senior analyst at Enterprise Systems Group, said. Igneous’ equipment uses ARM-powered nano-servers, consisting of a disk drive, an ARM processor and an Ethernet link. The System-on-a-Chip contains a Linux-running Marvell 32-bit Armada 370 processor, with two Cortex-A9 cores running at up to 1 GHz. Deepak Mohan, research director for Public Cloud Storage Services and Infrastructure at IDC, said: “Public cloud IaaS is rapidly gaining acceptance among IT organizations. Public cloud services are increasingly seen as an enabler of business agility and speed, beyond just an IT cost saving. Igneous Systems is venture-backed by groups including NEA, Madrona Venture Group, and Redpoint Ventures.